Today, we wanted to discuss 10 steps to effectively screen your application with minimal issues and find the best applicant. There are no fool proof ways to screen tenants, but these steps will hep you mitigate chances of accepting tenants who will not pay rent. 1) Have prospective tenants fill out a written or online application– realtors and licensed property managers usually have access to forms that applicants fill out in a written manner. It is easier to detect inconsistencies and issues when reviewing a written application. 2) Clear Eligibility Requirements-Realtors and landlords should have clearly written guidelines on what you are looking for a tenant. Realtors and property managers should be aware that this is the law in the state of Texas. 3) Review Criminal Convictions– HUD states that you cannot deny based on arrest, but you can evaluate convictions. This is due to “disparate impact” that proponents argue targets minorities. Therefore, managers and realtors should have ways to review criminal convictions not just arrest. 4) Review judgements for evictions, bankruptcy, foreclosures– Credit scores can be skewed by using legal protections to discharge debts,etc. Therefore, reviewing the applicants judgements may give insight into issues that tenant prospects have had meeting their obligations over the past years. Property Managers shoud know a idea of how many years that they want to have good rental history so this may help provide context as to why applicants have limited rental history. 5) Try to interview current and past landlords- Since property management firms and landlords need to gain better insight into how tenants will take care of your home. This means reaching out to interview them. 6) Try to obtain copy of current lease- There are times when a current landlord is unvailable. If you can get a copy of the current lease, then you can review contact information, terms,etc. Hopefully, you can confirm lease terms, rent, and owner contact information to match to what was provided in application. 7) Scan credit reports for issues on the report– If you can obtain credit report, then the landlord or property manager can scan to see if there are any amounts from places that look like apartment complexes to possibly detect damages or broken lease issues. You can also see in reports that there are other report addresses to confirm addresses provided. 8) Request copies of paycheck stubs– obtaining a few paychecks (we request 2 months) to help you identify if pay fluctuates or is it steady. It also allows land lords and management companies to verify employment information provided in the application. 9) Obtain pictures of animals- Do you accept pit bulls? Many owners will say no, but they may not realize that a more formal name for a pit bull is “staffordshire terrier”. By obtaining pictures, you and your owners can better understand what kind of animals a tenant may have with them. 10) Run applications on everyone over 18 years of age– If you have adults living in a home, you should know their criminal background and potentially rental history. What if a applicant who would be a occupant destroyed a previous residence? Without screening all adults that will live at the home, then you expose yourself to same risk of putting in bad tenants. Getting volunteers in an HOA can be difficult. Even more so when seeking members for the Board of Directors. One of the most highly asked questions regarding Board elections is procedure on finding and electing new Board members. Below are some tips that will help ease the process and ensure that your community members will be well informed when making a decision on the candidates. How far in advance should an HOA send notice of upcoming open Board positions? If a Director’s term is expiring it is a good idea to start seeking candidates at the beginning of the last quarter of their term. Three months may seem like a long time, but in many cases it will require multiple notices to the community to get volunteers for the open position. What should be included in the HOA notice? Include as much information as possible, but also be sure to follow your governing documents. It is also highly recommended that a Board Member Application form be included in the notice. This form would be completed by all interested parties and submitted to the Board, or management company, for review. Review in advance is necessary as in some cases a volunteer may not qualify to be elected (this is detailed in your HOA governing documents). Your governing documents will specify the elections and Board of Director’s positions in a variety of ways. The most common two ways are: Specific positions and terms, positions determined by volunteering for the specific position and elected to that position by the community at the annual meeting; or members are volunteering for “Director” positions and official Board position (e.g. President, Vice President, etc) is determined by a vote of the Board after elections are completed. Sample HOA – 6 Board of Directors Members to be elected. In the second scenario, with Board determined positions of all members, the notice would just specify that a “Director” position is open, detail the terms of the position, and notify the community that their position on the Board will be determined internally after the elections. How often should the HOA send notices out regarding the open positions? There is no set amount. It is almost always true though that the more you send the better your chances are of finding volunteers, but keep in mind the costs that could be involved. If most of your membership has an email address on file, Great! It’s a simple matter of sending an email out. If you have a management company you can use them to send out email and/or text blasts (be sure to check your contract and/or contact your management team as costs could be involved). If most of your membership does NOT have an email address on file you’ll have to consider the costs of postage into the number of notifications. How should the volunteers be presented to the HOA community prior to elections? The best scenario is to call a community meeting at least one week before the HOA’s annual meeting so that members can come and meet the volunteers. At the meeting each volunteer should speak to the HOA community about why they want to be on the HOA board and provide information on their background, skills, etc. HOA members should then be allowed to ask the volunteers questions. We recommend putting a limit on either the time or number of questions that each HOA member has with each volunteer. What if we don’t get enough volunteers? This is probably one of the biggest, and most difficult, questions HOA’s have. There is no quick and easy way to ensure you get volunteers, but the most common reason for not getting sufficient volunteers is not being informative about what being on the Board of Directors entails. Be detailed and open about each position, what is expected of the Board, etc. We highly recommend that current and/or prior HOA Board members be asked to speak about their experiences with potential volunteers. We are self managed, do we need any extra vetting of our volunteers? Yes! We highly recommend that self-managed communities invest in background/credit checks, as well as more in-depth interviewing of potential candidates, especially for those seeking the Treasurer position on a Board. 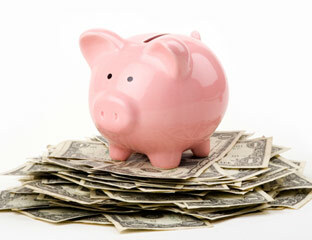 Savings 101: 4 Ways to Get You Back on Track! Many people struggle with building up a decent savings amount. When costs fluctuate from month to month it can be difficult to find a way to save for unplanned expenses. Did you know that most financial advisors recommend putting at least 10% of your total income into savings for your retirement or rainy day fund? In today’s economy this amount may be difficult for many, but putting SOMETHING away is better than nothing. When money is tight it’s even more important to ensure money is put aside to cover any emergencies that may arise. In January 2017 CBS reported that 57% of Americans do not have enough funds put aside to be able to afford a $500 emergency expense, such as a vehicle repair, high utility bill, etc. While income does play a factor for many, a large portion of these people are in this situation because of poor financial management. Managing your finances can be simple and easy, and can lead many out of the “living paycheck to paycheck” lifestyle. Below are some suggested actions that can help you start saving today. This is probably one of the most important items you can do to help manage your money and set up savings. Creating a budget shows you your income and expenses and if anything is left over. It can also give you a better idea of where you are spending more money than necessary. Once you set your budget you will need to track it, which can be done in a variety of ways but today one of the easiest ways for many is via an app on your cell phone. This allows you to have almost instant access to your budget and makes it significantly easier to track your expenses. Setting up an automatic transfer is important to ensure your savings account increases with minimal management on your part. That way you can ensure money is put aside even if life gets too hectic for you to manage it directly. Also many savings accounts gain interest, and while it may not seem like much at lower balances the interest keeps adding up and increasing your savings account. Be sure you are setting aside an amount you can feasibly do without. Having a goal can be a strong driving force for many. Set a realistic goal that is doable for your budget. Many people make the mistake of shooting higher for a goal, and falling short of your goal can lead many to give up. Reaching your goal can be extremely fulfilling, so you should set a goal around your budget. We all have these, and they can be something that’s seemingly inexpensive such as your daily coffee stop or something more expensive like eating lunch out at work every day. Think about all the extra purchases you do and start replacing some of them with a cheaper option. For example if you eat a lunch out every day at work you could spend an average of $35-$50 a week. Try bringing lunch from home a few days a week and you’ll start to see the extra savings immediately! One of the most common mistakes a HOA Board can make occurs in their minute taking during a meeting. Trying to participate and maintain accurate notes can stretch out the meeting and be overwhelming to many! Record the meeting! There are hundreds of free apps that allow you to record right on your smart phone. Don’t have a smart phone? No problem, you can buy a voice recorder for less than $20 on Amazon.com! You can then transcribe the important information after the meeting or even opt for a transcription service to complete it for you. Remember your notes must be clear and detailed, but every word spoken does not have to be retained. A basic synopsis of the topic,voting, and Boards decisions are all that are needed. Here is an example: Homeowner Sally A. brought to Boards attention that her condo roof is leaking into her 3rd floor master bedroom. Board agreed to proceed with bids from roofing companies. Voting can be simple! When the Board calls a vote the minutes must reflect the motion and total votes for or against, but information on specific Board members and their votes are not required, nor are full details of contracts as copies should be retained with the minutes. Here’s an example: Motion to vote in favor of extending contract with Sunnytime Landscapers. Motion seconded. Vote passed: 3 in favor, 2 abstained. 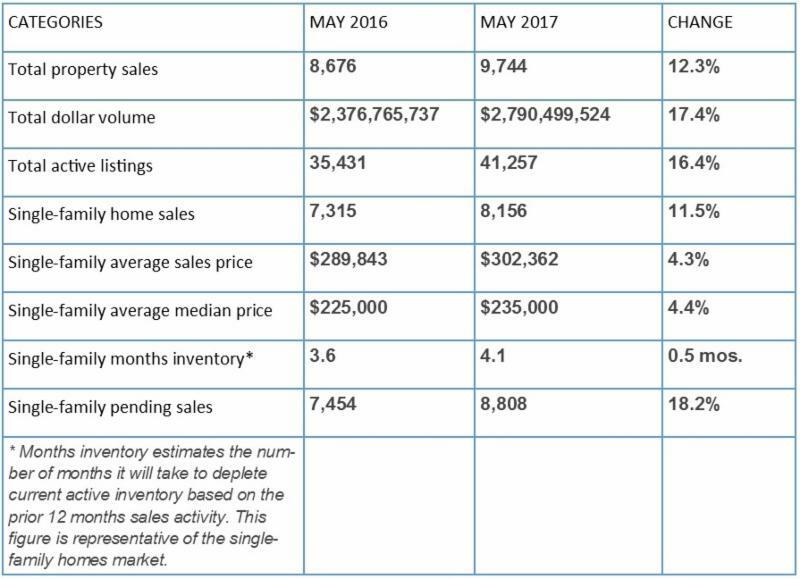 The sales numbers for May 2017 reflect the ongoing strength of the consumer activity in the area. According to HAR the end of May 2017 sales numbers are ahead of both projections and the sales numbers we saw in May of 2016, with the greatest leap forward in the luxury market (homes at $750,000 or more), which is followed closely by homes in the $150,000 to $249,000 range. Not only have sales increased over the same time last year, but the market has also show an increase in average sales prices, inventory, active listings, and more. Above is a chart from HAR.COM showing the comparison of numbers between May 2017 and May 2016. What’s this mean for you if you are selling? You can still sell and since sales prices are on the rise you could get more money than you could in previous months. But always remember to keep in mind the average sales price for your market area. A great way to do that is to list it with an awesome brokerage team, such as the Lion Real Estate Group (partnered with Carrington). Lion Real Estate Group has a dedicated team of agents that can help ensure your property sells when you want by comparing current market prices with your goals. They work with you and advise you on current trends in your area! What’s this mean for you if you are buying? Sales prices have been trending up in Houston since the beginning of 2017. If you are looking to buy now is the time to do it! Based on current trends we anticipate that prices will continue to rise, so get out there and buy now! Leasing has also showing some improvement in demand for both single family homes and townhome/condominium properties. In May alone single family leases increased 31% and townhome/condominium leases increased a staggering 46.2%! While the leases increased though, there was a decline in the average rents. Single family home rents decreased by 4.2% ($1779) and townhome/condominium rents decreased by 6.7% ($1565). For more information, continue reading the HAR May 2017 MLS report article located HERE. Your credit score can be the difference between being able to afford the new car you want or having to settle for a used car with no warranty because your interest rate is too high to afford anything else. It can be the difference between getting an apartment in a decent neighborhood or getting one in a bad neighborhood because you can’t afford the security deposit anywhere else. It can even be the difference between getting your dream job or working at the neighborhood grocery store because they don’t check your credit score for employment. You may think that your credit score isn’t important, but it’s use as a determination factor with companies is increasing at a rate that will make it significantly important in the near future. Keeping your score at “Good” or better should be a high priority. It not only allows you to have the flexibility to afford nicer things, but also allows you alternative options in emergency situations. For example, if you have a good credit score and your car breaks down you would have the options of financing the repairs at the shop, using your credit card, getting a personal loan, etc. You can get back on the road in a matter of days! But if you have a bad credit score your only option is cash on hand and in your savings back. For a lucky few you may have a secured credit card with a high enough balance available to allow you to charge the repairs, but many of you won’t get financing to cover the repairs. Credit scores are very important. It’s in your best interest to monitor it monthly. There are many great ways to do so, and some of them, like Credit Karma and Discover Credit Score Card, are excellent FREE ways to keep up on your score! HO6 (Condo) Insurance – If you live in a Condominium Association, chances are you may not have the insurance coverage you need. Many residents believe that their property is covered through the Associations policy, but in many cases this is not true! Association policies cover common property, so in the case of a building that coverage is typically only the exterior, “bare walls”, or “walls-in” coverage. So, what is the difference between each? Above are typical coverage for Association Policies, but each Association is unique. It’s always good to check your specific Association’s coverage before getting your own policy. The HO6 (Condo) Insurance Policy is designed to cover what the Association insurance DOES NOT. This coverage is important to all Condominium owners, whether you’re in a risky area or not! Additionally, if you are in a flood area you’ll probably need your own Flood insurance policy. FEMA has an 06 Condominium policy to provide coverage for what your Association Policy does not cover. You can read more on the policy coverage HERE. Always remember when buying a condominium to check your Associations coverage so you can get the appropriate coverage! The current weather forecast is looking pretty hectic for Houston, TX. Reports show Harvey increasing in strength and now is projected as a Category 3 Hurricane when it makes landfall this Friday, August 25, 2017. Current projected rainfall is at 5-15 inches between Friday and into early next week, which will bring potential flooding into the area. Now is the time to prepare in case your area experiences flooding! Below are tips on what you can do to keep yourself and your family safe during the turbulent weather coming to Houston, Texas! Protect windows with plywood boards, or storm shutters. Make sure you have plenty of fuel and water. Make sure you have lighting in case of a power outage, such as flashlights or battery-operated lanterns (do not use candles!). Have several days supply of food (non-perishable) and water for each family member. Prepare a first aid kit, or purchase one. Make sure you have cash on hand for purchases. Freeze all meat so it will last for several days if a power outage occurs. Freeze a gallon or two of water so it can be used to keep your fridge contents cool during an extended power outage. Bring in all loose outdoor items to remove potential projectiles during high winds. Have outdoor extension cords – a neighbor may have power and you don’t or vice versa, so work together to provide power to each other in these situations. Be ready to put your plan and preparation into action. Pay attention to local weather reports on radio, television, or the internet. Have house boarded up, or have storm shutters in place. Have plenty of food and water. Make sure all your tools, supplies, and first aid kit are readily available for use. Have a secure room available. Fill up your tubs with water – this is for flushing toilets. Be sure to have a battery operated radio available. Stay in your Secure Room. Do not use the phone, or candles. Monitor Weather and Civil Service Bulletins on either regular or NOAA radio. Remain indoors when the eye moves over your area because the storm will resume shortly. Make sure that all is definitely clear outside, and the storm has completely passed before going out. Report downed power lines, and stay away from them. Use stored water and food. Be patient. Things will take a while before they get back to normal. Home Cooling Tips – Beat the Heat this Summer in Houston, Texas! Home Cooling Tips – Beat the Heat this Summer! SUMMER – The heat is unbearable, humidity bogs you down, your only solace is your home, but wait – your thermostat shows the temperature inside is in the upper 80’s with your AC running!? This is actually a common occurrence that can result in wasted money when an AC repair team is called out unnecessarily. Before calling out a company here are some home cooling tips that can save you wasted money and time in the heat! Is it cold? Proceed to check the other items. Is it hot/warm? STOP – Call an AC professional. Air Filter – A clogged up air filter prevents proper airflow which can affect the temperature in your home. Be sure to change the filter regularly. If you have animals it’s always a good idea to replace your filter more often, no matter where your intake is located! Window Coverings – Not covering your windows during the day can significantly increase the temperature in your home. Below are some items that can lessen the solar heat in your home. Using these will require lighting to be on in the home, and bulbs can also generate heat. The impact is typically less and can be adjusted by changing your bulb to a lower wattage. These will reflect solar heat and still allow light into the home, so interior lighting is not needed as often. You can purchase these from a local home improvement store, and cost will vary, but results are similar to the solar screens above. Weather Seal – Doors and windows without a proper seal cause the cool air to leave the home AND the hot outside air to come inside! Check around your doors – faulty seals around the doors are the most common cause. Check around all your exterior doors and replace as needed. Check your windows – if you feel a draft you will want to caulk around the windows. Drafts are more common in windows that have multiple panes like the image below. Is your outside fan spinning? If so, continue to the next step. IF NOT – Call an AC professional. If the span is spinning it’s possible that your condenser coils are dirty and need to be cleaned. TURN OFF your AC before cleaning. If possible, open the top so you can more easily clean the coils. BE CAREFUL – Never spray water onto the coils at high pressure, this can bend the coil fins! A quick cleaning can be done by simply spraying water from your hose onto the coils, BE SURE to use a lower pressure setting on your nozzle such as “FLAT“. Any other type of cleaning should be done by a professional to ensure the fins, unit, etc. are not damaged. An HOA Board Meeting can be stressful in communities and Board members are volunteers, so many are not trained or experienced in some of the tasks that they are expected to accomplish. One of the biggest concerns for Board members is regarding Board Meetings. How to conduct it, prep for it, and more. This month we will discuss some of the common items that Board’s typically struggle with. Today our topic will be Agenda’s! Creating an HOA Board Meeting Agenda and sticking to it can be difficult. What should be included or not included? How specific should you be? Should they be provided to the community before the meeting? The questions can seem never ending, but below are some tips that can help resolve many of the common questions AND you can find our sample Agenda HERE! What should be included on our Agenda? Main categories need to be included with general information. For example, if you plan to discuss bids received for a pool pump replacement the agenda should have something similar to the following: Review Pool Pump Estimates from 4 vendors. Does the Agenda need to be shared with the community prior to the meeting? YES. Depending on your specific HOA governing documents/policies, you can provide the Agenda in several ways – digitally, posted in the community, by mail, or posted online. Some of these must be done in conjunction with each other, for example if you have a policy that allows you to announce meetings electronically you can provide a copy of the agenda digitally (such as on a community discussion board or web page) but you must also provide a physical copy by posting it in an easily view-able area of the community (such as on a bulletin board at your club house, pool, etc.). If you don’t have a policy that allows this you must provide a physical copy by mail to all community members. How detailed should my Agenda be? There is no required level of detail for an Agenda. You can be as detailed as you prefer, but to save on space we recommend keeping your Agenda simple like the sample version. ESPECIALLY if you have to provide a physical copy by mail! Is there a required format my Agenda needs to follow? No, there is no required format for Agenda’s. We do recommend using a format like the one provided in the sample to keep the Agenda from being cluttered. Why do we need to have an Agenda? Agenda’s are a great way to keep the meeting moving smoothly and on topic. Without an Agenda meetings can take significantly longer and, in many cases, important items can be missed! We hope the above tips and our sample Agenda help provide you with an easier HOA Board Meeting prep! Remember to bookmark our site and check back regularly for more HOA related articles. Ashoka Lion is happy to serve our local communities!